Click on the link to watch a demonstation of setting up the Portable VCWS 9 Whole Body Range of Motion. Bases is modifying some of the VALPAR Work Samples so that they are portable and can be easily carried and taken to a client’s home or to a clinic. They also will be valuable instruments for teachers and clinicians to use for developing soft skills and work hardening. The Valpar #9 Whole Body Range of Motion uses the same instructions and normative data as the original VCWS #9 but now weighs 21 pounds and is carried in a canvas portfolio bag. The heavy metal frame that supported the original VCWS #9 is replaced by using a standard 80-inch door. The work sample is adjusted by using chains and is adjusted to a height using the same standards as the original VCW #9. 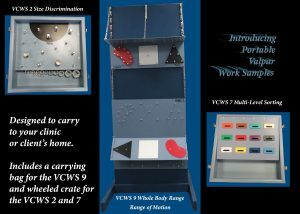 The VCWS #9 is still manufactured and a standard for the clinical setting where mobility is not needed. Valpar #2 Size Discrimination has been reduced in size so that it can be carried easily and put into a carrying case. Valpar #7 Multi-Level Sorting is being developed so that the evaluator can set up the work sample to test just color discrimination. They can then increase the complexity by changing the slots to Color and Numbers, Color and Letters, or a mixture. This work sample also will be marketed to schools and programs so that teachers can build the skills and increase complexity. The slots are interchangeable and fasten to the slotted board with magnets.